Welcome to the 43rd edition of the IH Journal and thank you for reading. We once again have articles covering most corners of ELT, so there’s something for everyone. We start with younger learners, with Xana de Nagy reflecting on what homework is for and giving us some principles to think about when setting it. New to the IH Journal, Carys Shannon writes passionately about using stories with children, while return author Maria Conca has some good advice and ideas on working on listening in the younger learner classroom. If it’s training and development you’re interested in, look no further than our regular TD section. We’ve no regular column this time out, but do have a good selection of articles for you to consider. Monica Ruda starts us off with her personal reflections on what might make some teachers reluctant to participate in professional development. Celestina Froude has some good guidance for teachers who’ve recently started teaching post-CELTA, something that school directors might also find useful to think about. Robbie McDonald then takes up the baton with his article on how to start moving up the career ladder, based on his own personal experiences as a teacher, assistant director of studies, and director of studies. Newer teachers should certainly find this whole section of the journal very interesting. For classroom ideas, Kam Yin Wu talks us through his scaffolded approach to teaching analytical writing, based on his own experiments in his classes. Richard Buckley moves us from productive to receptive skills by suggesting some fun ways to help our exam students become confident IELTS readers. Zooming out a little, Elna Coetzer deconstructs a lesson and looks at how a concept from cinema, the mise-en-scène, can help us deepen our understanding of the need for context and smooth transitions in our classes. For technology, we have no regular column for this edition. We do, however, have James Egerton taking a macro look at what changes in technology mean for teachers. If technology is something you are developing an interest in, James’ piece is a sound introduction to some of the major themes that shape the current debate. Moving to management matters, Maureen McGarvey’s column focuses on manager well-being this time out. There’s food for thought for more than just managers though and I found myself nodding at various points. Sandy Millin then presents some good advice for managers who often work with teachers who have relocated to a new country. If only every school had such procedures in place, more teachers would find the upheaval of moving less stressful. In Modern Languages Estelle Hélouin talks us through both sides of the recent debate on ‘inclusive writing’ in France. Is it right to use the masculine ending to describe a group of both male and female students, for example? Or is there an alternative? For speakers of languages like English, which does not have grammatical gender, this might not seem serious, but in a world increasingly focused on inclusivity these questions are there to be asked. Our Voices section continues apace after its successful introduction in our last edition. This time out, Anistasiya Kumar tells her CELTA story. What she learned on the course helped her develop her existing classroom practice and should chime with many readers. Emma Louise Pratt’s article on being an artist and a language teacher is one many teachers should be able to relate to. How do artistic practice and teaching practice relate and what can teacher artists learn from reflecting on both these interrelated sides of themselves? Emma asks the question and suggests some answers of her own. Finally, in our research section, Mike Bilbrough describes his findings from a recent study of using a programme of gesture in class, rather than text. Do we rely too much on text? While I would tend to think not, Mike presents some interesting food for thought. If you’re interested in how to research, Magnus Coney’s article on a recent action research project should prove instructive. In taking us through how he researched Dogme in practice, he breaks down various stages in the process and shows us that what we see on the surface might not be the answer we’re looking for. We then conclude with Philip Kerr making a welcome return to the IH Journal. Philip reviews Interaction Online by Lindsay Clandfield and Jill Hadfield, and is as insightful and balanced as we’ve come to expect from his writing. As ever, a big thank you to all our writers and readers. I hope you’ve found something you’ve enjoyed and, if so, why not contact the author to let them know. Then, next time out, you could top up your karma by writing something yourself. Chris Ożóg is a teacher, teacher trainer, and writer, based in Kobe, Japan. He works on various teacher training projects, CELTA and Delta courses, and collaborates with a number of different international ELT organisations, including Bell, Distance Delta, IHWO and CUP. He is also Editor of the IH Journal. His principle ELT interests are in the observation and feedback cycle in teacher development. 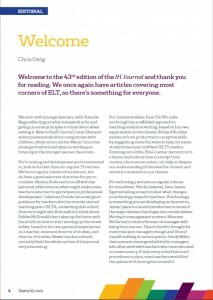 Back to Editorial, Issue 43: November 2017 of the IH Journal of Education and Development.